BrightPay has been designed to create unique and superior user interface coupled with maximum flexibility in the software functionality, in order to deliver the best payroll solution to customers and to meet the business needs of all employers. As you work with BrightPay, there are some underlying points which are key to the flexibility and superior level of functionality of the program. Each employee record works independently. This means that you can move the payroll forward, roll it back, build a report, view that employee calendar specifically for a chosen employee as opposed to executing these functions for all employees. This flexibility is facilitated through an employee filter option allowing the user to choose, from the listing of employee records on file, which employees each function is to be performed. The Analysis function within BrightPay allows the user to run the default reports or to amend them. Within this reporting function the user can build a report template which can be named and saved by the user to use at any time for any payroll period/range of periods. All reports can be customised and/or filtered to suit your reporting requirements, including /excluding payroll periods, payroll items and/or employees. Multiple pay frequencies are catered for within BrightPay; Weekly, Fortnightly, 4-Weekly, Monthly. All pay frequencies can be ran simultaneously within the one employer data file. An employee can be associated with unlimited departments. An employee’s payroll, including regular pay, additions and deductions, can be assigned to multiple departments being distributed by weighting. Unlimited hourly rates can be set up as defined by the users. An employee’s payslip, for any period, can have unlimited pay items, hourly rates, additions, deductions, and benefit in kind associated and listed against the payslip. When setting up an addition or deduction on a payslip it can be scheduled to apply for the current period or a user determined period. Within the Employee listing, if an employee name is displayed with an asterix/star, this is an indication to the user that a Revenue action is required in relation to the submission of a P45 Part 1, P45 Part 3 and a P46. 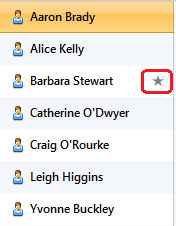 The employee asterisk/star will disappear once the user manually updates BrightPay to indicate that all required action has been taken. Once the payroll pay periods are set up, the earliest pay period, for which employees payslips have not been finalised, are denoted by an employee symbol within each relevant pay period. On completion of the payroll tax year, once all employees relevant payslips are finalised, each pay frequency will no longer show any open pay periods, i.e. there will be no employee symbols in any of the pay periods (as shown below). Where a Spanner is displayed against any item it means that there is increased functionality to this feature. Simply click on the Spanner for further explanation. Within the Payroll Pay period, a payroll summary lists the employees along with a summary of payroll totals for that pay period. Each employee, for whom the payslip has been finalised in that pay period, is indicated by a green tick against the employee name. Any employee's name which is not displaying the green tick, their payslip is still open, i.e. the payslip has not been finalised for that pay period.